When I was a teenager I endured an eye injury which left permanent damage. As a result I have a huge deficit in my peripheral vision, leaving me with a permanent blind spot. When I’m driving I’m extra cautious of this blind spot for fear that I may not see oncoming cars because of my deficit. 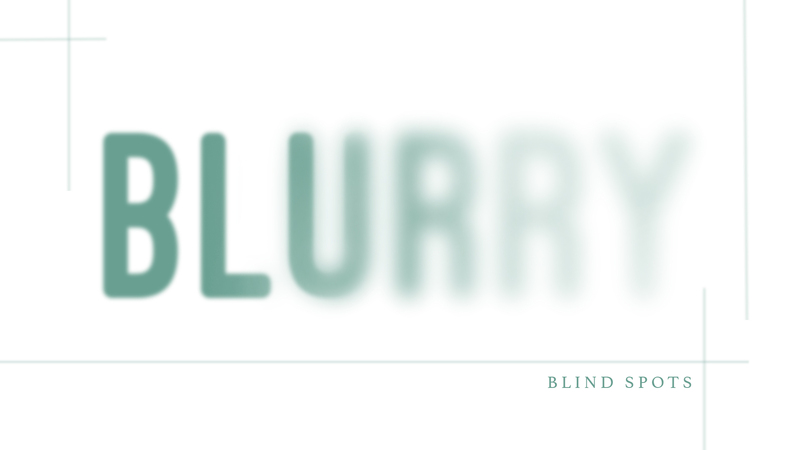 The funny thing about blindspots, is we can’t see them—then how do we detect them? King David a man who went from shepherd boy, to warrior, to commander, to king—had a huge blindspot. David was known for his tremendous faith in God and had everything he could have ever wanted, wives, power, a kingdom, wealth, victories, a palace, even the anointing of God (1 Sam. 16:13). Needless to say David had a huge blindspot in his life. His blindspot didn’t allow him to see he was flirting with seduction that brought him to the edge of a very slippery slope. We can only speculate, but what if David in that moment he saw Bathsheba stopped to pray before responding out of his lustful desires? I think his situation would have been drastically different. David eventually asked for forgiveness but not until God sent the Prophet Nathan to talk some sense into him (2 Sam 12:1,13). Nathan used a striking parable about a rich and poor man to reveal the atrocity of David’s actions (2 Sam. 12:1-5). It wasn’t until Nathan spoke the truth in love (Eph. 4:15) to David that his eyes were open to his secretive evil deeds and shed light on his blindspot. Nathan could have been killed for being so bold. Nathan knew David was a man after God’s own heart (1 Sam. 13:14) who had a blindspot. But God gave Nathan the wisdom to use the parable to lovingly speak the truth to David, so his blindspot wouldn’t destroy him again. Like David, we too can fall victim to our blind spots if we’re not careful. 1. By seeking God in prayer and asking Him to reveal our blind spots. 2. By allowing others to speak the truth in love into our lives—so our blindspots can be brought to our attention. We may not be able to see our blindspots, but God can. Our blindspots help us to constantly seek him for guidance and lead us straight on our paths. Are there blindspots in your life? We all have blindspots. Some of us might have blindspots in our finances, with self-control or in how we treat others. They may not all be the same but it is a part of our human nature not to be able to see everything that God sees. When we can’t see, God is the light on our paths. I am afraid of where my blindspots can lead me if I don’t let others bring them to my attention. To stay alert and aware I ask God to reveal any blindspots and if there is anything in my life that is getting in the way of God. I ask Him to expose and my blindspots making them visible with His light—so that everything that is illuminated becomes a light” (Eph. 5:13). Imagine if David didn’t allow Nathan to bring his blindspot to his attention? Lord Jesus, please expose our blindspots with your light, so they don’t cause us to stand on slippery slopes. Help us to keep seeking you for discernment and wisdom when making choices and decisions. Help us to allow others to speak the truth in love into our lives. Help us to stay in your will and plan for our lives so we aren’t flirting with disaster. You are greater and able to see so much more than we can. Help us to trust in you even when we can’t see. We praise you Lord. In Jesus name. Amen.